MR Online | Amnesty Now! When a gun-touting cowboy, who calls for 6,000 National Guard troops to be stationed along the US-Mexico border, is presented as having taken the “middle ground” in the immigration debate, you know how far to the right mainstream politics are in the US. Bush’s address on May 15 calls not only for strict border control but also a guest worker program with no path to citizenship. The terms of the “debate” are between the outright criminalization of undocumented immigrants (HR 4437) and their enslavement to corporations via a guest worker program (Hagel-Martinez, Kennedy-McCain, and other such bills in the Senate). That is not a debate at all in the true sense of the word: a debate on immigration must have two sides, one of which is pro-immigrant, but what we have here is only two anti-immigrant sides. One would be hard pressed to find the pro-immigrant side in the Senate or the House. Yet, sections of the media have given limited ground to the pro-immigrant force outside Congress, thanks to the protests and demonstrations of millions of immigrants, document and undocumented, who have demanded that they be treated with respect and dignity. At first, the movement set itself the task of opposing HR 4437, but as it sensed its own power, the call for amnesty rang out loud and clear at the May Day boycott and demonstrations. And contrary to the expectation of liberal leaders in the immigrant rights movement, this did not alienate ordinary Americans. If anything, the May 10 CBS/New York Times poll (cited below) suggests that there has been a shift in favor of immigrant rights. Enforcement and Border Security: The far right position on immigration is racist and rabidly anti-immigrant. As one racist in San Bernadino, CA, who advocates the denial of housing to undocumented immigrants put it — undocumented immigrants are turning American cities into “third world cesspools” (New York Times, May 16, p. A21). Tom Tancredo (R-Colo) has stated that immigrants are “a scourge that threatens the very future of our nation.” Right-wing media personalities like Lou Dobbs of CNN who sees immigration as being an “alien invasion” have also added their voice to this position. Groups like the vigilante Minutemen have taken it upon themselves to patrol the US-Mexico border. In response to the May 1 pro-immigrant demonstrations, they undertook a caravan trip across the US to win support for tighter border security. Bush’s proposal to deploy National Guard troops to the border will add fuel to the fires being stoked by the far right, as the neocons try to salvage their flagging administration by playing to their right-wing base. The Republican-led Sensenbrenner Bill (HR 4437) — passed by the House in December 2005 — represents an attempt to legalize anti-immigrant hysteria. It makes felons of undocumented immigrants and those who aid or assist them, increases penalties on employers who hire undocumented workers, and calls for the building of a 700-mile wall between the US and Mexico. As a way to pressure Republicans who support more moderate legislation, Tancredo called a “Just Say No to Amnesty Week” campaign, to bait supporters of guest worker programs. Yet, the strength of the immigrant rights movement has meant that today there are no equivalents to HR 4437 on the Senate floor, at least there are no proposals that simply criminalize immigrants. Instead, the proposals that are being debated today consist of some punitive enforcement measures and guest worker programs. This is because punishing immigrants and calling for tighter border security is not alien to the Democrats. Senator Hillary Clinton recently came out in support of the wall between the US and Mexico. And Democratic governor, Janet Napolitano of Arizona, supports Bush’s National Guard proposal. While criminalization and tougher border security is a way for Republicans to appease their far-right base, for Democrats it has been a way to outflank Bush from the right by positioning themselves as being tougher on terrorism. Guest Worker Program: Guest worker programs are supported by both Republicans and Democrats, who want to find a way to appease their corporate backers. Today, most of the proposals in Congress incorporate demands by the Essential Worker Immigration Coalition (EWIC), a coalition of 36 huge trade and manufacturing associations and headed by the US Chamber of Commerce. These proposals would allow guest workers to be used not only in agriculture but also in construction, meatpacking, hotels and restaurants, manufacturing, transportation, health care, and other sectors of the economy. It is a way to ensure a captive and cheap source of labor for US corporations. However, it is being sold to the American public as the right and fair way to treat immigrants who have “broken the law” and illegally entered the country. The assumption is that if immigrants follow the law they will be welcomed. This is of course untrue. Take just two examples: in 1882 the Chinese Exclusion Act deliberately kept out Chinese workers after their fellow countrymen had built the railroad system; and during the depression decade Mexicans were deported in large numbers. The case against immigrants is based on myths and downright lies: we are told that immigrants take jobs away from native workers, that they don’t pay taxes and instead take advantage of social welfare plans, that they drive down wages, etc. Thankfully, many groups, including organized labor, have debunked these myths. Guest worker programs in general create a second class of workers. They allow workers to remain in the country for a limited duration, after which they must leave or compete for a scarce number of visas. While in this country, guest workers don’t have the rights afforded to other workers. They aren’t allowed to collectively bargain, join unions, or speak out against exploitative bosses, and can only leave an oppressive job if they have another already lined up. This is why Cesar Chavez and the United Farm Workers could build the historic farm worker struggle only after winning the abolition of the last guest worker program, known as the bracero program, in 1964. Yet, instead of drawing the lessons from these historic struggles for immigrant workers’ rights, sections of the immigrant rights movement have come out in support of a compromise with the Senate. The Liberal Compromise Position: Several groups within the immigrant rights movement have advocated a more “realistic” approach to the immigration debate. However, realism and pragmatism are euphemisms for selling the movement short. 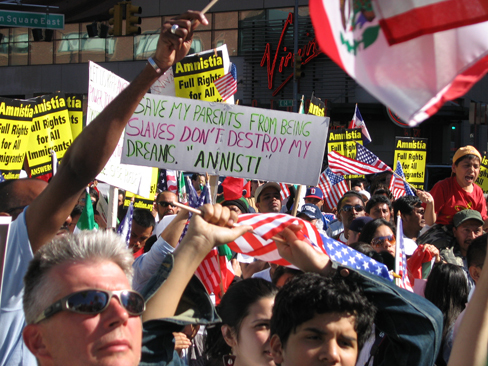 In the lead up to the national May Day boycott and demonstration, sections of the immigrant rights movement, such as the We Are America Alliance (WAAW), argued against them, stating that such radical actions and demands will alienate Americans and cause a backlash. As it turns out, this is not the case. A New York Times/CBS poll released May 10, 2006, found that there has been a shift in favor of immigrant rights since May 1. The poll found that there is considerable opposition to the harsh measures put forward by conservatives, with fully two-thirds opposed to the building of a 700-mile fence along the US-Mexico border. 60 percent of those polled said that they favored a plan that would allow illegal immigrants who have been here for at least two years to keep their jobs and apply for citizenship. Large sections of the public are to the left of mainstream politicians on this and other issues. The problem with calls for “pragmatic” and “realistic” solutions is that it concedes the terms of the debate to the right. When SEIU, a union whose membership is predominantly immigrant, argues for “secure borders,” it gives ground to the idea that the movement of workers across borders can and should be policed. The right is using the rhetoric of the “war on terror” to make border security a topic beyond debate. We should not fall into this trap. We have to point out that, rather than stop undocumented immigrants, increasing border security simply forces people to take desperate chances — crossing farther out in remote desert areas or facing exploitation at the hands of smugglers. Immigrants have paid for the bipartisan border-security hype with their lives. Since 1994, more than 4,000 undocumented immigrants are estimated to have died while attempting to cross. And the death toll keeps rising, so that, last year alone, the Border Patrol reported 473 deaths. Additionally, we have to point to the double standards in this argument: while corporations are allowed to freely roam the globe in search of cheaper and cheaper labor, workers are prevented from doing the same by immigration laws and “secure borders.” Unions that hope to challenge multinational corporations need to organize across borders and oppose immigration restrictions. Many in the labor movement may agree with this point, but argue nevertheless that compromise is all we can hope for now. Yet, three decades of compromise with management have left labor weaker today than it was in the 1970s. Immigrant workers have shown the way forward with their militancy — organized labor needs to support this struggle and demand amnesty for all undocumented immigrants. Amnesty: The demand for amnesty is based on the call for the immediate legalization of the undocumented, with a guaranteed means of attaining citizenship for those who wish to apply for it. Unlike current proposals, which use the deceptive language of “earned” citizenship or a “path to” citizenship and which exclude the majority from obtaining permanent residency, amnesty would treat immigrants fairly and grant them equality with native-born workers. The last time amnesty was granted in 1986, unions like the SEIU, and UNITE-HERE were able to grow tremendously from the legalization of 2.8 million people. This time, too, amnesty can help revitalize a much weakened labor movement. For the last three decades, the working class in the US has been under a relentless attack by corporations. Neoliberal policies, aka the “Washington Consensus,” led to the strengthening of the power of capital and the weakening of labor. Today, the average working family works long hours for low wages and is saddled with a huge debt. Immigrant workers, who bring radical traditions of class struggle from various Latin American countries, have shown that workers don’t have to take these attacks lying down. Groups like the National Network for Immigrant and Refugee Rights have taken a position against compromise and against the expansion of guest worker programs. So far, however, the organized left that advocates amnesty (such as the Mexican American Political Association and the March 10 Chicago Coalition) is small and has fewer resources than the more mainstream liberal organizations. While the AFL-CIO has said that they do not support the Hagel/Martinez bill, they haven’t pushed for amnesty either, thus backtracking on the work done over the last few years (such as the Immigrant Workers Freedom Rides of 2003). Their ties to the Democratic Party will mean that the organized pressure on them will come largely from the right, unless rank-and-file members take action. We find ourselves at an important historic moment. The self activity of millions of immigrant workers has not only opened up another side in the immigration debate but has set an example for how native-born workers might fight back. While the Senate is expected to pass one or another horrible anti-immigrant bill by Memorial Day (May 29), the demand for respect and dignity raised by immigrants is contagious and could spread to other sections of the working class. In this context, where we stand, what we think, and most importantly, what we do, matters. 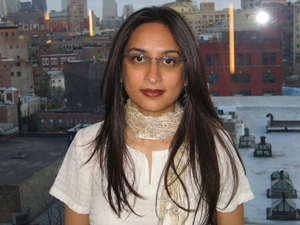 Deepa Kumar is author of Outside the Box: Corporate Media, Globalization, and the UPS Strike, (University of Illinois Press, 2006, forthcoming). She is active in the antiwar movement and has spoken at several community-based and university forums on the topic of fighting Islamophobia. She will be speaking at the Socialism 2006 conference in New York City in June 2006.